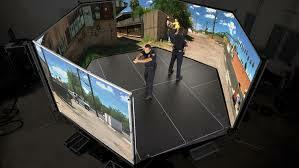 On Monday, December 19, 2016, it was announced that Tempe, Arizona based VirTra Incorporated will provide seven advanced virtual training simulators to the Arizona Department of Public Safety as well as six enforcement training facilities throughout the state as part of a $2.1 million dollar package facilitated by the Arizona Legislature. These simulators provide the latest in cutting edge, technology-based, realistic training in a 300 degree view training environment which can be used by multiple officers. In addition to allowing multiple officers to participate in a given scenario, the system allows for implementation of de-escalation techniques, as opposed to the traditional “shoot/don’t shoot” scenarios most recruits and officers go through during basic and in-service training. The Arizona Law Enforcement Academy, ALEA, where Phoenix Police Department’s recruits undergo basic training and sworn active and reserve officers attend in-service training, will receive one of the simulators. This asset, combined with the recently revived annual 40-hour training module, will allow our officers to continue to participate in realistic training to better prepare them for the difficult dynamic and fluid real-world situations they face on the streets every day. CLICK HERE for the recent story covered by ABC15 News.